When kids sit next to a caring adult and hear engaging stories, they develop positive associations with books. Reading aloud to your child strengthens the part of their brain associated with visual imagery, the ability to understand stories and word meaning. When you read to your three-year-old, they pick up on important book smarts, like how to hold a book and which direction to turn the pages. These skills are called "concepts about print," and they help kids prepare to be successful independent readers. Reading to young children helps build bonds, vocabulary and habits. Reading to young children helps build bonds, vocabulary and habits. If reading a story is part of the bedtime routine from infancy or toddlerhood, your child will likely become even more invested than you are in maintaining the tradition. Keep at least one small basket of books at kid level — and expect them to get chewed on, stepped on, spilled on and adored! In this activity, you'll find ways to emphasize hygiene and handwashing while practicing letters and letter sounds with your child. Illustrations can help kids build their vocabulary and start to understand emotions. Illustrations can help kids build their vocabulary and start to understand emotions. When a sad, happy, angry or surprising event occurs, pause to look at the characters' facial expressions. Ask, "How do you think she's feeling right now?" Authors who are particularly skilled at portraying emotions in both words and pictures include Kevin Henkes, Patricia Polacco, Arnold Lobel and Mo Willems. Predictable books follow a pattern — such as repeated lines or obvious sequences (days of the week, letters or numbers). Predictable books follow a pattern — such as repeated lines or obvious sequences (days of the week, letters or numbers). Young kids love "Brown Bear, Brown Bear, What Do You See?" and, more recently, the Pete the Cat series, because they can quickly anticipate what comes next and can become involved in the reading experience. Once children pick up on the pattern, prompt them to recite key lines or complete a sentence that you start. Nursery rhymes and rhyming books, such as "The Cat in the Hat" or "Chicka Chicka Boom Boom," also help to get children involved in the story. In “V is for Vacation,” Duck finds many things that are shaped like the letter V, including a “V” formed by birds flying together. Help your child learn the shape of the letter V in this fun tag game. Parents sometimes struggle to find books that will hold their child's attention. Parents sometimes struggle to find books that will hold their child's attention. The children's room at your local library can be your best ally. Browse the stacks and displays or — better yet — ask the librarian for recommendations based on your child's age and interests. Many libraries host story hour — a great opportunity not only to expose your child to reading but also to hear how another adult reads and engages kids with books. For online book recommendations by age, try Reading Rockets great read alouds for babies through Grade 3. A trip to your local library can be lots of fun! Help your child find a book on butterflies and metamorphosis and then act out how a caterpillar turns into a butterfly. It's tempting to rush through books on the way to another activity. It's tempting to rush through books on the way to another activity. But by occasionally pressing the "pause button" before you turn a page — stopping to notice something about a picture, to explain a word, to ask a question, to make room for your child to ask a question — you can support your child's learning. Prompts like these show kids that you are engaged in the story too: "Wow. Why did he do that?" or "Oh my. I wonder what she's going to do now!" Experts recommend that parents and caregivers ask kids to predict what will happen next when reading a book together. What do you think is going to happen next? Oh no! What is she going to do now? What would you do if you were him? How are they going to solve this problem? After they share their idea, respond with "Let's keep reading and find out what happens." Strong readers aren't passive — their minds are constantly making connections. The grandma in this story reminds me of your grandma. They both love making pies and telling stories. Hey, she has brown eyes and loves dinosaurs — just like you! Look at all those tall buildings! It looks a little bit like New York City, where your uncle lives. He seems nervous about the first day of school. Do you remember your first day of school? There's a bear in this story! What other stories have we read about bears? In this interactive book, your child can learn early literacy skills and about helping care for a new baby in the family. On this very special street, children learn early language and literacy skills such as letter knowledge, vocabulary, and reading and writing fundamentals. Your child can learn about uppercase and lowercase letters with this matching game. Your child can practice rhyming skills with this fun ball game. Super Why, Wonder Red, Princess Presto, and Alpha Pig can help your child practice reading, writing, spelling, and rhyming! Help your child build storytelling and oral vocabulary skills while playing six interactive mini-games with the whole family. In this game, your child can help the Word friends by solving riddles and making them a basketball. In this game with Alpha Pig, your child can practice letter knowledge by matching a letter card with the first letter of a word that starts with that letter. 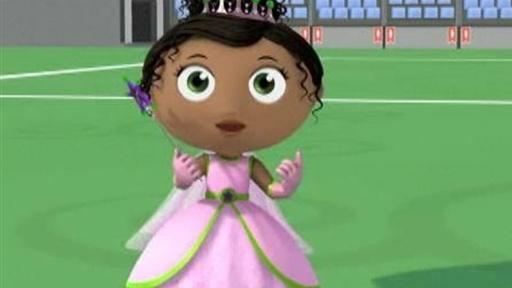 Princess Presto is playing soccer but the team doesn't know how to pass. In this clip, your child will learn what "pass" means and how to spell it.